Avis is a car rental agency that caters to business travelers flying into airports around the nation, and in Europe, Canada and Mexico. Avis is the second largest car rental company in the United States. 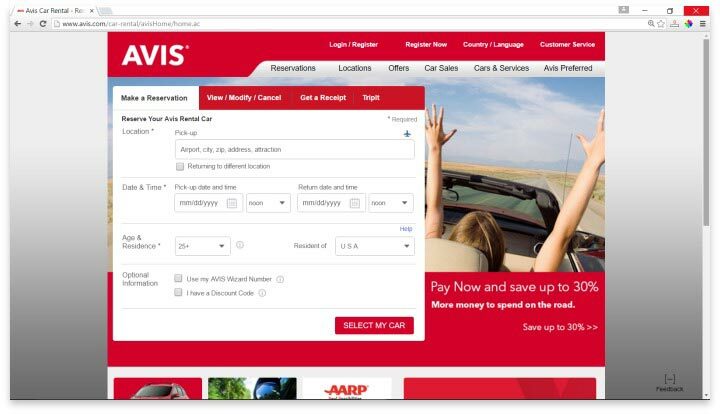 Avis makes it easy to rent a car with their online system. The company partnered with TripIt, which allows customers to input all their itinerary information once, and TripIt will fill in the blanks for each reservation request made at various travel-related sites. Drivers have a lot of options for car choice, including basic Economy sedans, full size cars, various sizes of SUVs and vans, and a menagerie of premium selections that include some of the most sought after names in the car industry, like Mercedes and Maserati. Consumers should consider enrolling in the Avis Preferred program before making a reservation. Membership is free, and it includes access to special offers, the ability to skip the counter at most locations, and quick and easy upgrades. Members also earn points that can be redeemed for travel incentives in the future. Regular customers who spend $5,000 in a year get bumped up to Avis Preferred Plus, which includes free upgrades, access to VIP customer service representatives, special offers and additional points. Avis offers other ways to save on rentals. When consumers pay at the time a reservation is made they can save up to 30%. There are also other incentives, like free days and upgrades, or reduced rates for rentals in particular destinations. Avis customers seem happy with one big perk offered by the rental agency – they offer a shuttle at most airports. This was often cited as the reason the particular customer chose Avis, and it helped the traveler have a smooth experience. One of the main complaints from consumers is Avis’ apparent inability to honor reservations. A large percentage of people state that they prepaid for their reservations online, only to arrive to find there was no available model in the class they paid for. They were told they could either pay more for a higher class, or drive off the lot with a lower class vehicle, without a refund of the price difference. Some consumers also reported being quoted and paying one price, only to arrive and be forced to pay an additional fee for their rental. In addition to these issues, according to the complaints, customer service’s responses to the renters’ complaints were met with apathy rather than attempts to rectify the situations. Avis offers a higher end fleet than most other rental companies, and they market themselves towards the customer who enjoys luxuries in life. Avis, like all rental companies, service varies depending upon the location you use. There are some definite perks in using an Avis rental. They offer a higher end fleet than most other companies, and they market themselves towards the customer who enjoys luxuries in life. That’s why it’s so frustrating their customer service just isn’t up to par. When renting a car from any rental company, including Avis, protect yourself by reading all of the paperwork before it is signed and paid for, no matter what the rental agent says, so you don’t get surprise charges, and take pictures of the vehicle from all angles to ensure you don’t end up owing for damage that was caused by a previous driver. Have you had an experience with this company? Please share your Avis reviews below.